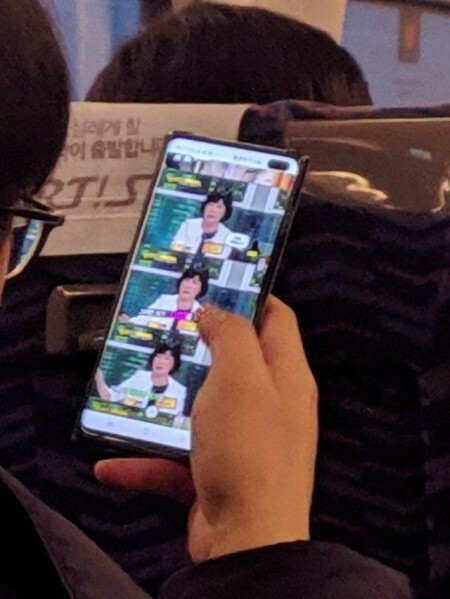 The posterd confirmed this is the Galaxy S10+ with a flip cover, but the user removed the watermark on the screen with the employee ID and the device SN. 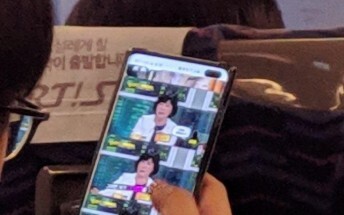 The picture was likely taken on the bus from/to the Suwon campus where Samsung Electronics's key facilities are. The device is still in its pre-production case that is used to hide the design until the very last moment. The phone is reportedly lighter than a Galaxy Note9, despite being the same size. The hole on the top is not noticable at all, although he couldn’t properly try gaming or video watching due to the watermark across the screen, therefore he can't share any thoughts on that issue. There is a fingerprint scanner under the display, but aside from these two technologies, the differences from last year's flagship aren’t huge.